PCH, Superpower Malaise Showdown: 1978 Ferrari 308 or 1980 Lotus Esprit? While the 8-door '57 Chrysler limo almost beat out the stretched Ferrari 400i limo in our last Choose Your Eternity poll (and what an upset of reigning PCH Superpower, Italy, that would have been! ), V12 power and Italian build quality seem to have triumphed over fins and rust. Today we need to see how Italy fares against its fellow PCH Superpower, Great Britain (with the winner moving on to take on France, of course). And, just to make things more fun, we're going with some serious Malaise machinery today, because Euro-Malaise is inherently cool-yet-hellish. 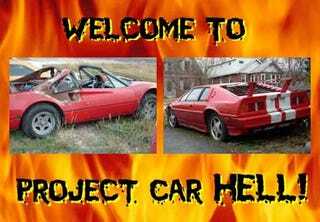 Can you get a Ferrari project for just $5,500? As anyone who has gone car shopping on any Craigslist site from Florida to Texas for the last year can tell you: Yes, you sure can! I've been running across the infamous Eddy, Texas Ferrari (go here if the ad disappears) for as long as I've been doing Project Car Hell, because the seller just won't give up! Many readers have sent in tips on this one, and now- finally!- I'm using it. So, why can't the seller unload this genuine Ferrari 308 for even as much as a Fiero-based "Ferrari" sells for? Sad to say, this car has been "toasted." Actually, I'd say "damn near completely consumed by flames" would be a more accurate statement, but enough of the hair-splitting- this is a Ferrari for $5,500! It has an engine and transmission and at least three genuine Ferrari wheels. This project is not impossible! Yes, it needs a few parts, but think of it this way: from the very moment it clanks onto your driveway, you're a Ferrari owner (and that moment will be the last happy one you spend with your new project for many, many years). Burned Ferrari sitting in a Texas field? Is there anything in the same price range that can compete? How about that mighty British Malaise Warrior, the Lotus Esprit? Say, one for the exact same price as the Ferrari? Not possible, you say? Check out this 1980 Lotus Esprit, (go here if the ad disappears) located in the profoundly iron-oxide-friendly state of Delaware. The wing! The stripes! The V8 engine "not in car" (and maybe not even included in the deal)! The seller describes it as "awlsome," which we're assuming is not a typo; you'll feel as though an awl is being hammered into your skull every time you try to make this car drive. The body is in "great" shape and the interior is "good," so you'll be able to concentrate on all the mechanical components in need of work (i.e., all of them). Oh, and the electricals; go ahead and console yourself that Lotus was not a British Leyland company, but the Prince of Darkness had a hand in there somewhere.